Yealink SIP-T41P/T42G IP Phone | 8x8, Inc. 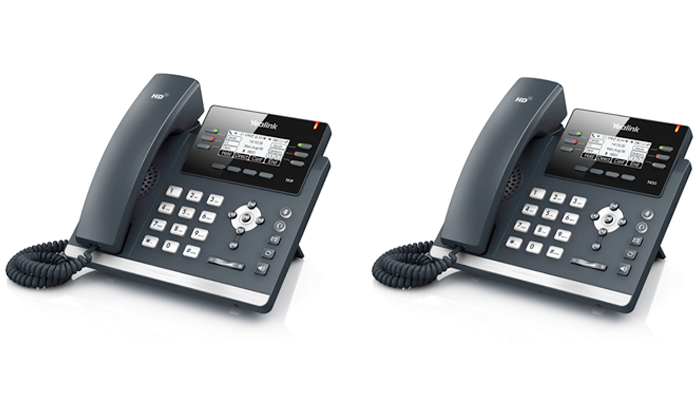 The Yealink SIP-41P is a durable entry-level business phone that delivers unsurpassed voice quality and clarity. It provides a high-quality, cost-effective solution for front line staff handling low to moderate call volumes. The intuitive grayscale user interface makes navigation easy and requires minimal training. It improves productivity for office workers and provides easy-to- use line key appearances. Uses standard encryption protocols to perform highly secure remote provisioning and software upgrades. The Yealink SIP-42G model comes with a built-in Gigabit Ethernet bridge to connect a high speed device such as your laptop to your phone. 6 line key buttons – Use the standard 2 line keys for managing two live calls on your phone at the same time, and use the 4 others as speed dial keys (T41P). 12 line key buttons – Use the standard 2 line keys for managing two live calls on your phone at the same time, and use the others as speed dial keys (T42G). Get all this without the need for adding a sidecar. HD Voice — Yealink Optima HD Voice provides advanced acoustic clarity technology, including full duplex, echo cancellation and adaptive jitter buffer. Enhanced Call Management — Supports call forward, call transfer, 3-way conference. Efficient Installation and Provisioning — Seamless activation and provisioning over the internet with the 8x8 platform.